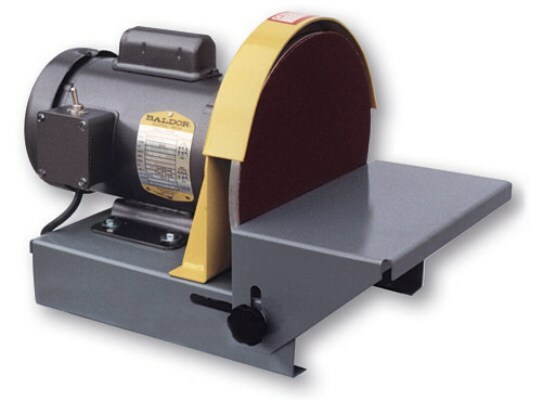 MODEL DS10-4S 10" disc with 4" belt sander. 1/2 HP, 1 PH TEFC motor, full OSHA belt guard. Wt. 84 lbs. MODEL DS10-4 Same as above without full OSHA belt guard. Wt. 76 lbs. MODEL DS10-2M 10" disc with 2" belt sander. 1/2 HP, 1 PH TEFC motor. Wt. 76 lbs. Heavy-duty, all steel. Tilt table, 45° down, 15° up. Optional MG10 mitre gauge. 10" aluminum disc, 5/8" arbor. MODEL DS10 10" disc sander. 6" x 11" table. 1/2 HP, 110/220V, 1 PH TEFC motor. Wt. 48 lbs. MODEL DS10V 10" disc sander, complete with enclosed stand and vacuum dust collector. 1/2 HP, 1 PH 110volts.Wt.110lbs.